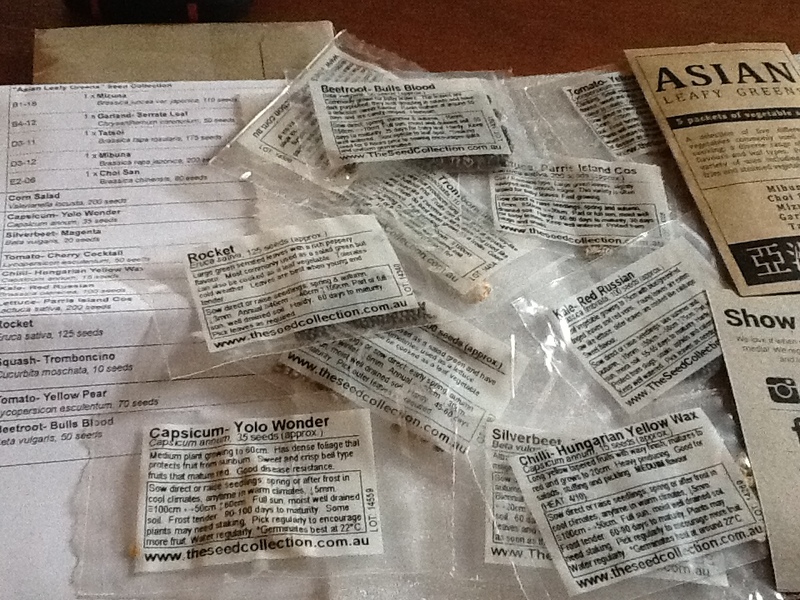 I know I have mentioned in the past that I really love to order seeds from The Seed Collection. I just placed another order to get ready for my growing season. They have a great selection and all their seeds seem to come up and grow into healthy plants. They also have some great articles, a couple written by yours truly. .
Disclaimer - I did receive credit for some articles I wrote. This is one on Wicking boxes and the other one is one of my favourite subjects Composting. This is what I ordered - some old favourites and some new ones. Mibuna - this looks like an interesting one - quite mustardy so I plan to pick when young. Tatsoi - love this - one of my all time favourites. It is a little like baby spinach. Corn Salad - we used to buy this in France - so awesome - I just hope I can grow it here! Chili - Hungarian yellow wax - I grew these years ago and they were very prolific and didn't seem to attract as many pests as capsicum. Lettuce - Parris Island Cos - One of the few lettuces that grow well here. Squash - trombonchino - these are just so cute looking - I don't have a lot of room, so hoping to grow it up a trellis. I always get so excited at this time of year, anticipating a garden chock a block full of yummy vegetables. Are you trying some new vegetables this year? or sticking to the old tried and true favourites? It's good to have a great seed source. In another month I will be receiving a lot of free seeds for my garden. I hope they will be good and flourish into wonderful crop this summer. Happy gardening! Oh lucky you, also getting some free seeds! the old favourites are going to have to go i am afraid, they just don't grow in this heat & last years winter which was barely cool nothing came up cos it wasn't cold enough! so i think it is time for me to try other alternatives to the traditional vegies, Brazilian spinach does well here & the chooks love it too, so i need to look into more of the temperate to tropical or arid varieties. will try a few at a time; i love Morag Gamble's blog, "Our Permaculture Life" & some of the weird & wonderful foods she grows; like your list there, i've haven't heard of most of those. Hi Selina, I am not sure where you live, but I do know that the temperatures have been horrendous all over Australia this year. We cant unfortunately tell what our future weather will be like (despite predictions) so I do like to branch out and try new things occasionally. Hope you enjoy trying something new. I love Morags blog!